There are some quirks here, but they're small sacrifices to make for the B100's colossal range of vintage-voiced tones. Pickups sound great. Lots of tones available. Good value. Cramped controls. Looks won't be for everything. 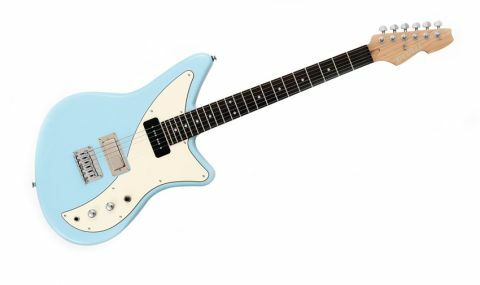 With their bonkers offset bodies and 60s-inspired sounds, Italia guitars have certainly created a splash in the modern electric market and now Italia has grown large enough to launch its own sub-brand: DiVill. So, if you like the Italia philosophy, but you're looking to save a little extra dollar, DiVill is the place to be. We know it's superficial, but we can't help bringing up the B100's look: that pickup combo reminds us of a pawn shop guitar that's been gutted and retrofitted a few too many times. However, it also affords the B100 maximum tonal versatility. "With a P-90 in the neck and mini-humbucker in the bridge position, there are an awful lot of tones within your grasp"
With a P-90 in the neck and mini-humbucker in the bridge position, there are an awful lot of tones within your grasp, especially through judicious use of the flexible tone and volume controls. Those pickups sound fantastic, too. The P-90 delivers tight rhythm tones without humbucker brashness, while the middle position thins out the tone for a middle single coil-esque sound. Meanwhile, the mini-humbucker is brighter than regular 'buckers, and its sounds reside somewhere between P-90s and humbuckers, with plenty of single coil-like cut - it's a bit of an enigma, as far as pickups go, and we love it. The mini-humbucker presents its own idiosyncrasies. With a heavy dose of gain, our review model's bridge pickup exposed some microphonic tendencies. That's testament to the guitar's vintage voice, though - early mini-humbuckers were known to produce similar squeals at high gain. There are more quirks on the playing front, too. While the unfinished neck plays like a pricey S-type, that awkward lower cutaway limits upper access, and the control knobs are a little cramped for our liking. Still, these are small sacrifices to make for the B100's colossal range of vintage-voiced tones.